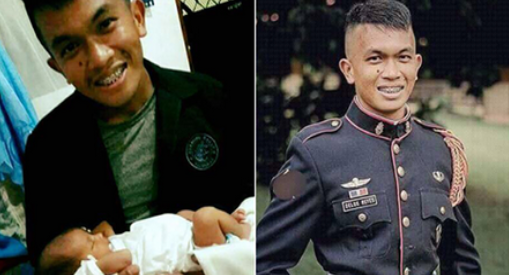 A post grabbed numerous greetings of sympathy when @salutetothefallen posted on their Facebook page a photo of corporal Eric Delos Reyes of Brgy. Tagasilay, Zamboanga City of the Marine Special Operations Group that died from excessive wounds he got from shrapnel in his body as he tried to save his fellow soldiers during their clearing operations. He valiantly covered the grenade with his body before it went off. "Ang sundalong si Corporal Eric Delos Reyes ay nasawi mula umano sa mga grabeng sugat ng shrapnel na tinamo sa iba’t ibang bahagi ng katawan sa kagustusan nitong masalba ang iba niyang mga kasamahan mula sa sumabog na granada habang ginagawa nila ang clearing operation noong Lunes." "Si Delos Reyes ay residente ng Barangay Tagasilay sa Zamboanga City at kasapi ng Philippine Marine Special Operations Group. Buwan ng Hulyo lamang ng kasalukuyang taon nang magpakasal sila ng kanyang misis." Read the comments from netizens who are sending out their respect also poured in. Jose Dorotheo Pandan: It pains me to know that another member of the AFP paid the supreme sacrifice for us to have our freedom. Thank you Sir with my highest respect! My deep sympathies to his bereaved family. Avatneloca Joelanpaks: My deepest sympathy and condolences of the bereaved family of fallen heroes in Marawi siege. Thank you for ultimate sacrifice to protect our freedom. Your heroism still remain forever in our heart and never forgotten. May your soul rest in peace warrior. My snappy salute to your bravery, courage and patriotism. Mavic Dahili Villajuan: rest in peace my ihado. last time I saw you on the day of your wedding, you were very happy, not knowing that yun na pala ang last happy moments mo with ergelyn's friends & relatives same as with your family. Your heroic deeds will always be remembered. Have a peaceful flight to heaven ihado. Lorna Saavedra Lagas: Bye ihado, yun na pala ang ist & last na pgkikita ntin mtapos kau ikasal ni gelyn. Ngpaalala pa ako sau na mg ingat. I know u're now at peace w/ d Lord. My deepest sympathy to his wife ergelyn & his family.